The willful enjoyment of another’s pain or suffering. 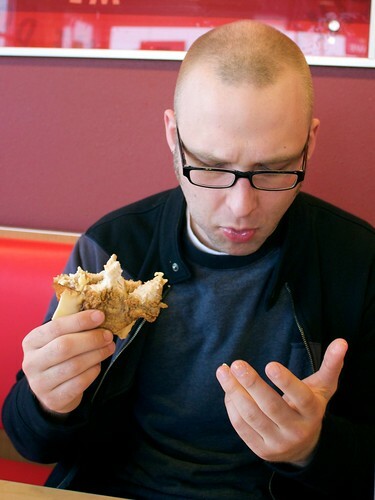 I vow from this day forward to never again eat another KFC Double Down. It has wreaked unmentionable havoc. 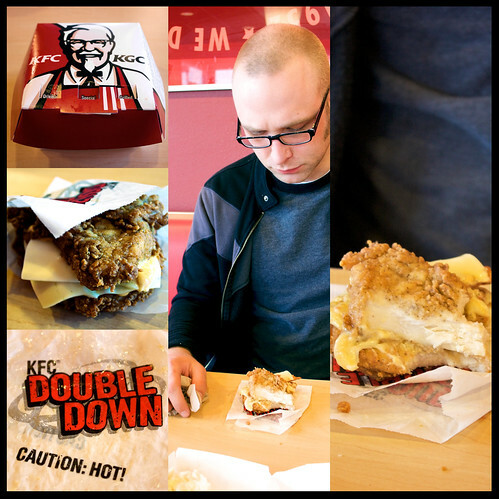 Grease spouts forth with every succulent bite of the KFC Double Down. Finding a job has been a slow monotonous grind. As my serious job prospects continue to dwindle I have resorted to patent absurdity in hopes that it garners results. The following is an actual response to an application question. If there were no restrictions placed on me I would be the owner of a successful unicorn megafarm called Fager-Einhorn GmbH in Germany. The tears of my unicorns would be used to cure Type-1 Diabetes, but not Type-2 because that would be just silly. The milk from the mare unicorns would be used to cure cancer and AIDS. Of course as the owner I would make these cures available for free and win the Nobel Peace Prize every year. I would also wear a sombrero to celebrate my native Wisconsin heritage. Have you ever seen that Brad Pitt and Bruce Willis movie 12 Monkeys? Last weekend Kaela and I decided to check out Eastern State Penitentiary in Philadelphia where the asylum scenes were filmed. 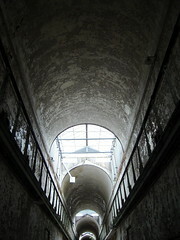 Operating between 1829-1971, the penitentiary became the model from which most modern prisons were built. The notion of solitary confinement was taken to such extreme in this prison that inmates literally lost their sanity. Charles Dickens’ senses of the prison were so offended that he details them in his work American Notes. In its intention I am well convinced that it is kind, humane, and meant for reformation; but I am persuaded that those who designed this system of Prison Discipline, and those benevolent gentleman who carry it into execution, do not know what it is that they are doing….I hold this slow and daily tampering with the mysteries of the brain to be immeasurably worse than any torture of the body; and because its ghastly signs and tokens are not so palpable to the eye,… and it extorts few cries that human ears can hear; therefore I the more denounce it, as a secret punishment in which slumbering humanity is not roused up to stay. The prison is also notable for housing Al Capone, having a dog as an inmate, and being home to a few children over the years. Today the prison is in a state of “preserved ruin.” Be sure to check out my Flickr gallery along with the following links. With the exception of when I lived in Germany, my weight has been stable around 185 pounds since high school. I started student teaching in January and now weigh 175. 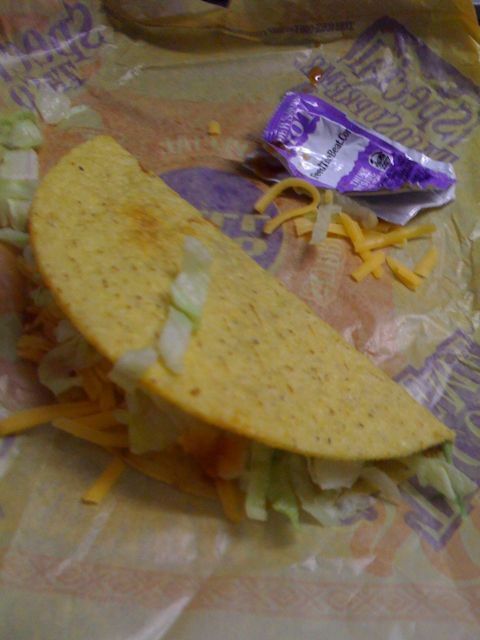 Apparently I should be eating more tacos from Taco Bell. Prescription Solutions has mismanaged my prescriptions for well over three years now. I have had enough and its time to draw the line. Consumer rights are something I don’t take lightly. A certain multinational shipping service learned this the hard way. On January 13, 2009 I placed an order by phone with Prescription Solutions to refill my supply of Accu-Check Aviva Blood Glucose test strips. I placed this order by phone once again, because the website would not grant me the convenience. There will be more on that issue later. Something more pressing has garnished my fulmination. When I spoke to your representative over the phone I specifically outlined the shipping address. I recall the event with great clarity because even I had difficulty spelling the street name, despite maintaining residence here for a number of months. Grabbing the nearest piece of mail I read aloud the following. Where did Prescription Solutions send the package? The two addresses certainly sound similar, but if you read them aloud, one can discern their subtle differences. By the time I checked up on my order it was too late. On January 16 I placed a call to make light of the error and was promptly put on hold for 15 minutes. In the interim that it takes for this package to eventually find its way I will run out of test strips. This presents me with a choice. Not check my blood sugar levels and run the risk of excessively high- or low blood sugar levels, ketoacidosis, eye damage, dehydration, frequent urination, kidney damage, irritability, coma, possible death, and a wide range of other health maladies. Buy more test strips at my local pharmacy and make meaningful connections with other human beings. Submit all receipts to the insurance company individually by mail for reimbursement. Perhaps it was the Divine’s plan that I choose the latter. Refilling my prescriptions with your company has been a nightmare at every turn. Going to the local pharmacy will require that I return frequently as I can only obtain a 30-day supply of the four prescriptions I need to lead a healthy life. The convenience offered by getting 90-day refills with Prescriptions Solutions is negated by the problems encountered with every order. I have not placed an order online in recent memory because there is always an error. When placing calls for orders sometimes the server is down and my refill is not completed. I have had to remind the staff that I do have insurance and the account number has not changed. Then there is the complete address nonsense outlined above. After my prescriptions expire I will not be refilling them with Prescription Solutions. This letter has been published online. In taking this matter public I offer Prescription Solutions every chance for rebuttal. With nuggets like this from Sarah Palin and this one from Joe the Plumber, how can you not hope for another comedic campaign? But seriously I’m having election coverage withdrawal. Yesterday I stopped at a Country Kitchen to eat dinner on the way back to Oshkosh. While flipping through the menu I came across this breakfast abomination. No wonder childhood obesity and diabetes rates are skyrocketing. Nouns are the words for persons, places, things, or abstract qualities. In English we capitalize personal names because in America we like to raise kids to think “everyone is special in their own way.” You aren’t. Everyone has a capital letter in front of their name. You are not special. You are not a beautiful and unique snowflake. The word “I” is always going to be capitalized too. Names of official places, offices, and points of location are also capitalized. New York, Wisconsin, Honolulu, Lake Titicaca, Fire Department, Triangle City Square, Wal-Mart Avenue, and Dave’s Discount Urologist Megamart/Payday Loans. Got it? Super. So are formal titles like our last unquestionably and legitimately elected Commander in Chief, President Clinton. As far as I’m concerned Mr. Bush is about all the respect the current guy holding the office deserves. When Senator Obama is elected we will refer to him as President Obama. If Senator McCain is elected I will seek asylum in Germany. Writing the noun for another foreign language needs to be capitalized. English, German, Spanish, Russian, Chinese, Newspeak, etcetera ad nauseum until English is the only language left due to globalization. All other things and abstract qualities that make up the rest of all nouns are not capitalized. Unless it appears as the first word in a sentence, then “noun” isn’t even capitalized. English is cruel and confusing like that. So what makes German nouns, or Übernomen as I like to call them, superior to English nouns in every way? In German a Nomen (noun) is always capitalized (notice how I capitalized Nomen earlier in the sentence. Awesome.). Capitalize just the first letter though. Otherwise you run the risk of being one of those ANNOYING PEOPLE WHO FALL ASLEEP ON THE CAPS-LOCK KEY when you write. German words for people, places, things, and abstract qualities all are capitalized no matter where they appear in a sentence. A Nomen is easier to spot in German than in English because 99% of the time it is going to be capitalized. The remaining 1% are reserved for Apple products like the iMac, iPod, iPhone et al. Let’s take a look at some Nomen in this sentence. Grab a Sharpie marker and circle the Nomen on your computer screen. Günther Rockmysocksoffenstein (name) besuchte Berlin (place) mit seiner Gitarre (thing) und Schwanken (abstract and questionable translation to follow). Günther Rockmysocksoffenstein (name) visited Berlin (place) with his Guitar (thing) and swagger (abstract). German also has a peculiar rule when it comes to nouns. If you are a boy read Boy Paragraph A, if you are a girl read Girl Paragraph B. Remember when you were a young boy and you would mash two toy cars together simulating a horrible accident? Well imagine that each car is a noun. Now mash the two noun-cars together. Walla! The horrible pile of shorn metal you’ve smashed is now one whole new noun – a.k.a. compound noun. Remember when you were a young girl and you would put your Barbie dolls on top of each other pretending they were kissing? Well imagine that Barbie and Ken each symbolized a noun. Now mash their lips together and wait nine months. The love-child-noun that Barbie and Ken created is a new word entirely – a.k.a. compound noun. A compound noun is two German Nomen mashed together. It is theoretically possible to mash as many coherent nouns together to adequately describe the intricate details of a person, place, thing, or abstract quality. The primary piece of advice Douglas Adam’s Hitchhiker’s Guide to the Galaxy gives us is “don’t panic.” This is meaningful advice in this scenario as most German compound nouns are not that long. Most are a logical combination of just two or three words. Try to guess what you get when you combine the German word for “main” and “city” together. Haupt + Stadt = Haupstadt or capital city. Let’s try it with three words crammed into one. Take the German words for “arm” and “band” along with “clock.” Arm + Band + Uhr = Armbanduhr or wristwatch. You can see in Hauptstadt and Armbanduhr that only the first letter is capitalized. This is true for all compound nouns. Writing HauptStadt and ArmBandUhr would be incorrect. Be aware that compacting words together and guessing at their logical meaning is not always so easy. One of my favorite Nomen has no real definitive English translation. That word is Schadenfreude. As a compound noun Schadenfreude is comprised of the words for “to harm/do damage” and “joy/happiness.” Schaden + Freude = Schadenfreude or “the enjoyment of another’s pain or suffering.” Why do you laugh when you see a home video of someone getting hit in a sensitive area during ABC’s primetime TV programming? It is a bit of an abstract concept, but that is what Schadenfreude is. You laugh because someone else got hurt. Ich sah in dem Fernseher Bob Sagets Hoden geschlagen und fühlte Schadenfreude. I saw Bob Saget’s manbits get clubbed on TV and it made me feel (a guilty kind of) happy. Perpetual capitalization and the intimidation factor presented by compound nouns are why German nouns are superior to English nouns in every way fathomable. If you think that’s the end of it, you would be wrong. There is even more to the Übernomen that I have not covered. Nomen have a feature that is absent in English, namely the assignment of one of four possible genders. That, my friends, will have to wait for another day. I just blew your minds and you’ll need some time to clean the itty bits of brain from the inside of your skull. Addendum: Nomen is not to be confused with the club NoMen on 19th and Harrison Avenue down by the docks. I totally made a fool of myself trying to pick up chicks there once. The dance music was really good though. Corrections and suggestions are welcome via the comments. You may have seen the commercials for GoldKit, where you send in your old jewelry for cash. According to the official website they will buy all of your “scrap gold jewelry, coins… you can also sell a gold tooth.” I wish that last bit was a typo, but it is not. Here is the deal. 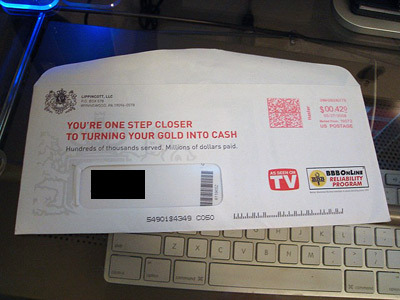 GoldKit sends you an envelope to put your gold in. You send it back in a pre-paid Business Reply Mail envelope. They send you a letter back detailing what your stuff is worth, and you get to decide if you want to cash in. How could I possibly resist taking part in this scam? I dashed to the official website and within 48 hours a GoldKit envelope arrived in the mail. Only it arrived unsealed. Classy. I definitely want to send my precious metals in a company’s envelopes when they can’t close properly. 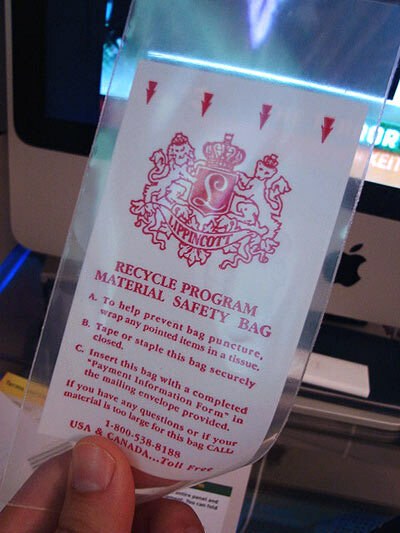 It is time to load my precious metals into the enclosed bag and envelope. Stay tuned to see how this turns out. 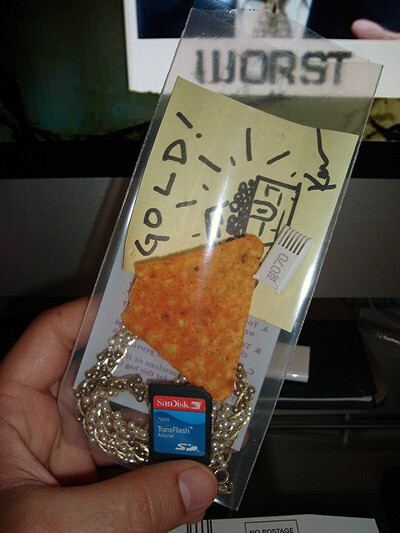 I hope the Dorito gets there in one piece.